Jay Dougan, associate professor of art and design at Fort Lewis College, is showing new work in the Durango Arts Center Library. “Pattern 36,” 3-D printing, wall drawing. 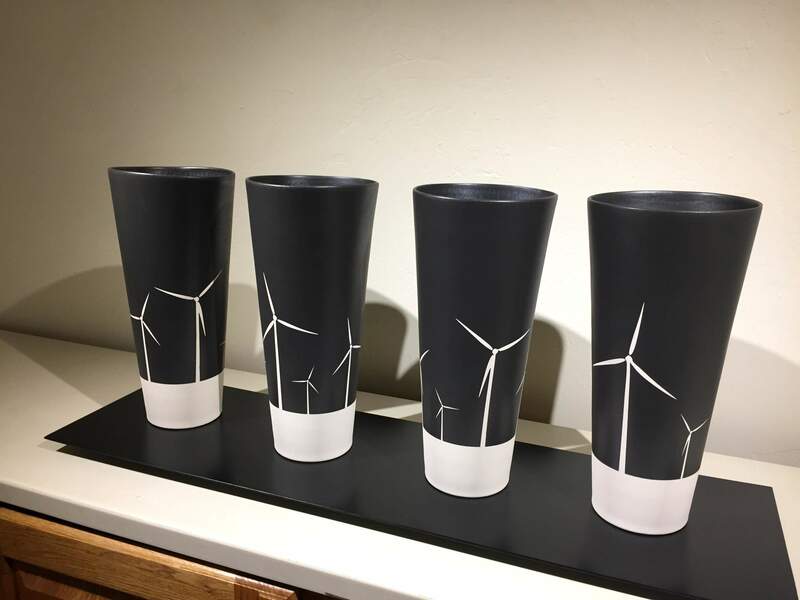 “Windmills,” porcelain slip casting, black manganese glaze, digital die cutter. Cool and elegant, new works by Jay Dougan currently fill the Durango Arts Center Library. Clustered into three groups, they represent a relatively short and intense period of exploration. 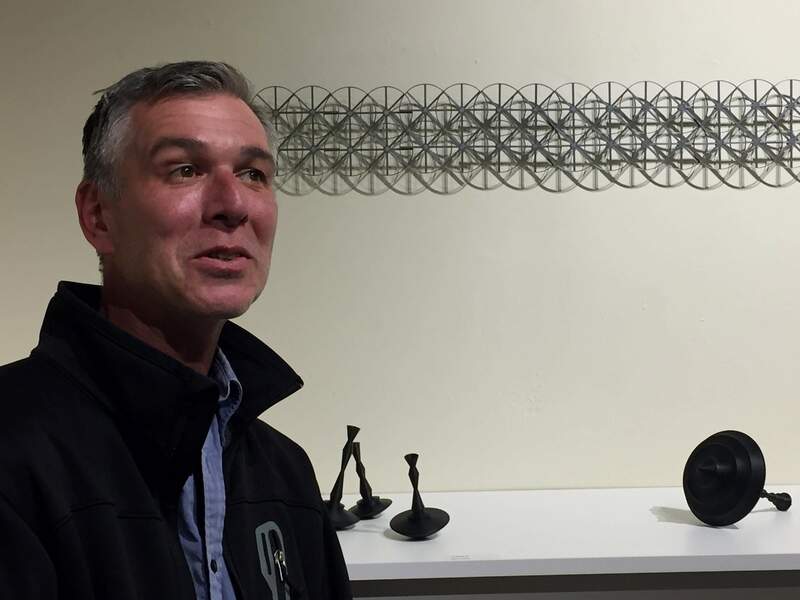 The modest title, “A 3D Production,” says a lot about Dougan, associate professor of art and design at Fort Lewis College. Dougan has been experimenting with two new technologies for less than a year. In a recent interview, he said he powered through six months of excitement and frustration to come up with what’s on display at DAC. “I wanted to investigate how to use machines to help me create my work,” he said. And so he has. The exhibit’s three sections include wall pieces, what Dougan refers to as his drawings, ceramic vessels and shelf full of small, black plastic tops. Each group reflects different avenues of interest for Dougan and access this year to a 3-D printer and a digital die cutter. These tools enabled Dougan to open new doors and old memories. The airy, almost spiderlike wall piece resulted from Dougan’s experiments with the 3-D printer. He said he sketched the elements and programmed the computer to print out multiples. 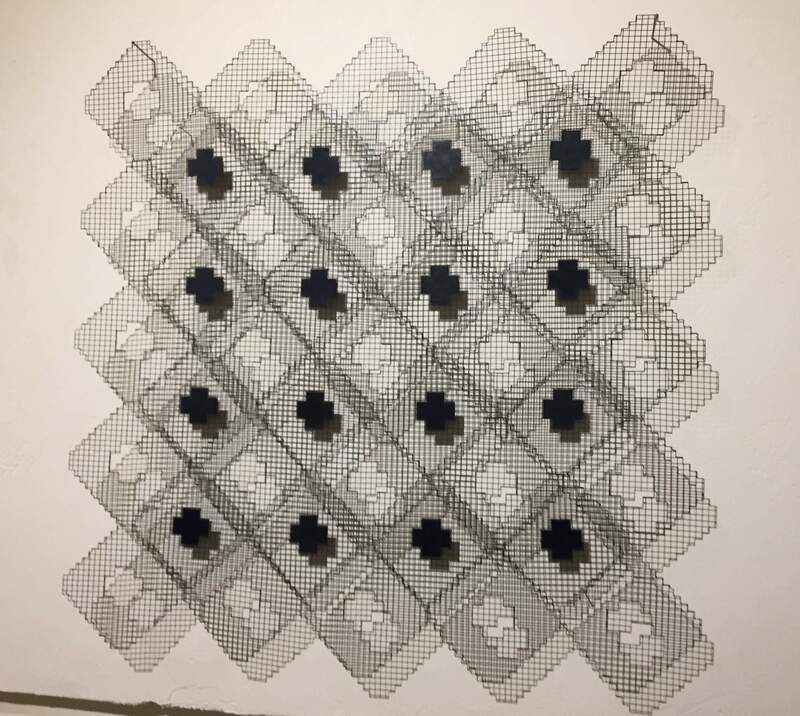 After assembling a grid, he mounted the web on a wall. With added light, the filigree construction created another design component – a shadow pattern. “I’d come back in the evening here at DAC and move the lights around to change the shadows until I got what I wanted,” he said. Dougan’s ceramic pieces are entirely different than the 3-D drawings, but they also exude an interest in classical purity. Tall, slip-cast porcelain vessels are something of a signature for Dougan. He’s explored the form before with colorful glazes and patterns. Here, he’s shifted to a crisp, black-and-white surface with distinct imagery, windmills and an engineer’s compass, by using a digital die cutter to create sharp edges. The precision is startling; the opposite of free-flowing color and texture seen in Dougan’s earlier works as recently as last September in the FLC faculty exhibit. For some time, toys and playground equipment have surfaced in Dougan’s work, reflecting the child within and also a reference to a particular person. A year ago, Dougan said he didn’t know how to do any of this – 3-D wall structures, a new approach to porcelain vessels and 3-D tops. “I make my own assignments and set my own parameters,” he said. “Limitations are great. They focus you on an area and you have to stay within some guidelines. I encourage my students to experiment, work in series. Jay Dougan, associate professor of art and design since 2007 at Fort Lewis College, focused on ceramics in his collegiate career, but he now considers himself a sculptor who explores different media. He holds a master of fine arts degree from the University of Notre Dame and an undergrad art degree from Western Michigan University. Before coming to FLC, he taught at the Herron School of Art and Design in Indianapolis, Notre Dame, and a community college in Dowagiac, Michigan. He’s had a number of solo exhibitions around the country and won the 2008 Durango Public Library commission for “Card Catalog.” Filling the stairwell, it’s a brilliant conceptual work that light-heartedly evokes the history of library technology. If you haven’t seen it, or passed by without noticing, walk up to the second floor and let Dougan’s artistic skills and sense of humor give you a new lease on conceptual art. What: “A 3D Production,” new works by Jay Dougan. When: Now through Dec. 23.